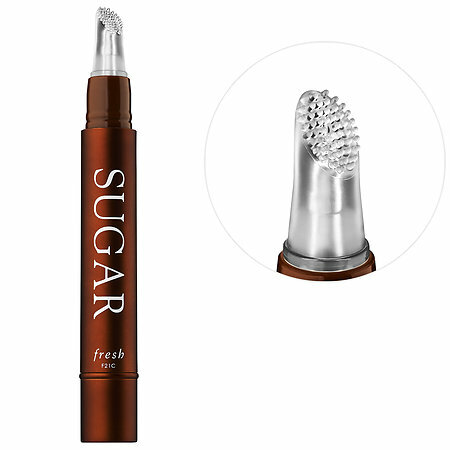 Finally there's a lip exfoliator that feels like an lip treatment at a spa and not a grainy, painful, harsh experience..
Fresh Sugar Lip Treatment Perfecting Wand is a multitasking lip treatment that gently buffs and nourishes lips to smooth and soften them. The innovative applicator is infused with loofah oil, along with cupuaçu and mango butters. The formula is also has black currant seed and grapeseed oils, rich in antioxidants, to help hydrate and protect your lips. I clicked the pen a few times to release the thick, slightly gooey, textured gel. Then I rubbed the brush with the silicon scrubbers in a circular motion all over my lips. My lips were soft, smooth and hydrated not just immediately after, but for hours after the treatment. The scrubber, along with the gel removed all my dead skin and flakes, and made my lips look pinker and plumper. The Fresh Sugar Lip Treatment Perfecting Wand finish is a natural gloss, similar to a lip gloss, but with no stickiness or tacky feel on the lips. I liked using Fresh Sugar Lip Treatment in the AM after cleansing my skin, and before using lip color, as well as at night before bed so my lips were hydrated overnight and didn't have any dry, cracked feel. The pen design is perfect to toss in any bag or travel case, as well as on your desk in your favorite pen cup.